I didn’t know anything about this movie upon watching it except that it garnered near universal praise among critics. Unfortunately enough, that is usually a death sentence in my mind because it becomes impossible to live up to my newly raised expectations. If you like animals or fairy tales and aren’t a stickler for realism then you might enjoy Life of Pi but otherwise I wouldn’t strongly recommend it. A word of warning: it is impossible to have a serious discussion about this film without major spoilers so just know that moving forward. Aside from all the media hoopla about this being a life-changing movie, I tried to lower my standards and come into Life of Pi with a clean palette. In a strange twist, the movie itself missteps and promises to tell the audience a tale that will "make you believe in God." The audacity of the statement is wondrous and pulls the viewer in but will very surely be tested by the end of the experience. Life of Pi begins entertainingly enough with funny family anecdotes and experiences in India but the crux of the narrative is centered around the tragedy that occurs at the end of the first act. There are two versions of the story that follow: the animal story, shown to the audience over the next 60 minutes through lush colors and CGI, and the human story, told half-heartedly in an ending twist through a 1 minute monologue. The apparent purpose of the film is to spark introspection in a viewer who decides which version of the events is true. The psychological aspect of Life of Pi holds interest. A young boy, put through serious trauma, anthropomorphizes his experiences based on his childhood zookeeper history. But even this account falls flat as the real meat of the story happens within minutes and Pi is left alone with the tiger for the majority of the tale. It is tempting to reflect on how this represents the conflict within himself but there aren’t any discoveries or lessons learned as a result. And even so, this is the obvious view that, while interesting, doesn’t lend support to the overall theme of belief in a higher power. So let’s get into the two stories. Supposedly, the human story is the true account of four survivors trapped together on a lifeboat and the cruel and tragic events that led to them all dying save one. The animal story, on the other hand, is a wondrous fable portraying the survivors as animals, glossing over their deaths, and focusing on the ensuing internal struggle of the lone Indian boy, Pi, to survive. Nearly every analysis of the film frames the viewer’s choice as thus: a cold, calculated, secular thinker will prefer the realistic human story, and a spiritual and heartfelt sympathizer will prefer the romantic animal version. I take issue with this drawing of lines- how is a story of a boy seeing his mother killed and then growing up any less inspiring than seeing a tiger kill a hyena that killed an orangutan? The belief of a higher power doesn’t lessen the tragedy of either, and surviving on the open sea for nearly a year is miraculous no matter the version of events. And while the animal account focused mostly on the adventures after the tragedy, the human story bluntly related the deaths of the others. Essentially, the animal story was given unfair advantage to be invested in, with the human side not even appearing in visuals, so those who believe in the latter are dismissed as cold hard factual people devoid of faith, when that is not nearly the truth. Ironically, the beginning of the movie that focused on a boy in India named Pi was the best part. The ‘modern day’ framing device of the novelist asking an older Pi to recount the events of the past was hackneyed. What’s worse, the allegory should have been the point of analysis. Instead, Pi, who weaved this amazing tale after almost a year alone at sea, quickly gives in to the skeptical investigators and confesses the true events. This plot development is not believable either for a boy recovering from a wondrous experience or from a trauma victim who has blocked out painful memories. Especially since, at least in the movie, the investigators just wanted to know why the ship sank and didn’t care about the events that followed. On top of that, the annoying novelist then spells it out for the audience that the animals represent the real victims. Not only is the tiger parable unreal, but there is no believability in the post events or even the modern day recounting. As an aside, getting into the actual storytelling of the animal story, there was a mix of good and bad. The CGI was a visual feat at times and the composition of colors was often stellar, but many scenes were very distracting and had me focusing on the uncanny valley more than the plot. But it wasn’t just the mixed visuals, the events too often shattered any suspension of belief. Knowing the ending illuminates that the allegory WAS fake and that the story WAS SUPPOSED TO be silly. To me, though, this conjures up memories of The Village- everybody spoke in a fake annoying 18th century accent that grated on my nerves but at the end it was revealed that, "Aha! ", everything really took place in modern times and THAT’S why the accents were so bad, but the delivery still ruined 90% of the movie. Life of Pi’s stuttering between the emotional and the inane had similar effect. By far, the biggest issue I have with Life of Pi is the teaser: "I will tell you a story that will make you believe in God." With a quick ending that has a single suggestive phrase, there just isn’t any pay-off. I kept looking for meaning to this story but every analysis obtusely stated that it was up to the individual viewer. I’m sorry but, after a 2 hour journey, that is the ultimate cop out. Pi asks the novelist which story *he* prefers, to which he replies, "the one with the tiger." Pi answers, "And so goes with God." He then smiles and pretends that he has delivered on his promise to prove that God exists, and the two men share an uncomfortably touching yet meaningless moment. 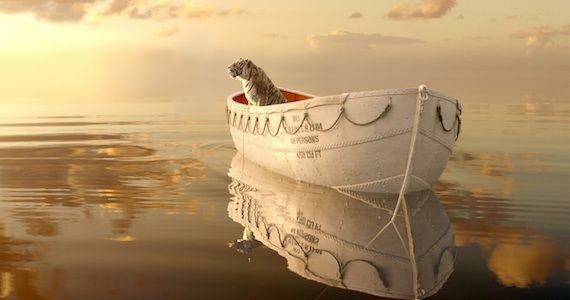 My contention with Life of Pi has nothing to do with the religious undertones in the theme, it’s that the majority of the film had little to do with a higher power and the ending, while attempting to appear haughty and wise, had even less. It’s strange, because the only interpretation that makes any sense to me is that the young Pi, who believed in all gods and religions, now understands that they are only fairy tales to make people feel better. Just like his first allegory was a fabrication, it was something he told himself because he preferred it. It seems a counter intuitive message for such a spiritual experience and I doubt that’s what the creators intended but I think that just underscores the dangers of relying on the viewer. A lot of critics credit Life of Pi for being ‘ambitious’ but this is what people say when a movie doesn’t work. This is what everyone said about Cloud Atlas. I’m not against a fanciful allegory of a tragedy but the trappings of spiritual enlightenment were strangely unfulfilled. A fairy tale can be a beautiful thing when framed correctly and, unfortunately, Life of Pi serves more as a lesson of what *not* to do.